This is the time of year when it gets hot in our area. Availability of water is critical to the health of your bee hives. I found that an easy inexpensive water system involves a simple poultry water bucket that you can get from your local feed store. 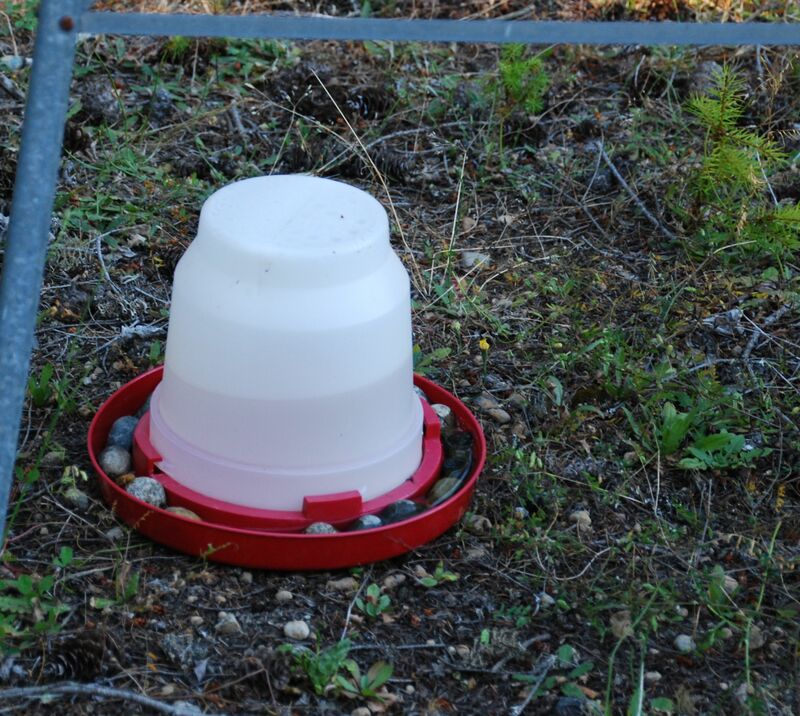 I find that this small one works great and I just put small rocks in the base to give the bees a place to perch as they get a drink. Because the top is somewhat clear I can see when it is getting low so that I can fill it up again. 55% Carbohydrates, 35% Protein, 3% Minerals & Vitamins, 2% Fatty Acids, 5% other stuff. So, back to the water, we went on a short vacation. Before leaving I made sure everything was squared away in my apiary. Each hive was strapped down (in case a wind storm came up while I was away), set up a swarm trap, made sure the water bucket was full. While I was away either it was really hot and the water evaporated….or a racoon or other wild animal drank the water. In any event when I came back the first thing I noticed was that the bucket was dry. A few days after having filled up the watering can I noticed that there were no bees drinking from it. Earlier in the year I would always see a dozen or so bees at a time getting a drink….but now nothing…..odd. A week or so later I was talking with my bee friendly neighbor across the fence. She noted that she loved seeing my bees drinking from a plant saucer that they have near a window at her house. I was at first concerned that my thirsty bees might be intruding, but she reassured me that both she and her husband liked watching them and that they happily kept the saucer full. 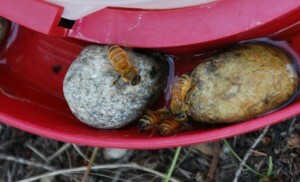 So….two morals to the story; 1) Always keep an ample supply of water close by for your bees. In this case I was lucky, had it been a swimming pool or deck fountain even the best of neighbors might not be happy. 2) Keep your neighbors happy about your bees. Keep them informed when you are going to be getting them and let them know how they are doing…and of course they should always get the first of the honey when you collect it.